SIGforum.com Main Page Mason's Rifle Room what magpul magazines to get? In a couple days I will take delivery of my first custombuilt AR. Now I need some more magazines. With my other AR I was using USGI, Oberland Arms and various Magpul magazines. Now I'm not quite so sure about what generation of Magpul Magazine to get. Is the higher price of Generation 3 really worth it? I kinda like the idea of being able to see how many rounds there are left, but other then that I have no clue. The citizen watches the watchman, not the taxpayer. Stock up on some Okay Industries SUREFEED magazines to go with the Gen M3’s. can't get Okay Industries magazines over here. Sorry, I didn’t see you were in Switzerland. I have not noticed any functioning or quality difference among the various Magpul magazines. The earlier generation mags are, however, a little wider than the more recent ones, and that has caused problems with certain guns with narrower magazine wells. The generation 1 magazines my agency has are a tight fit and won’t drop free from the early S&W M&P rifles we also have. The base plates of the various generations are different, and therefore things like aftermarket extensions or even Magpul’s “ranger plates” must match the magazines we’re using. And then there are the colors. I haven’t followed all that closely, but I believe that certain colors are/were available only with certain generations. @striker1: don't worry, I'm used to that. @sigfreund: good to know. I'm not that familiar with AR-magazines. Mostly I use SIG-rifles where magazines are not that big an issue as there are only two suppliers. I tend to the generation 2 magazines since they are cheaper. I used to make a big stink about my mags for ar's back prior to 2010. Shortly there after it seems most of the main magazine manufactures tended to consolidate specs. They all seem to work just fin in about anything i put them in. My preference like you is Gen 2 magpul for 5.56/223 guns. I run Hex mags for 300 black out simply to give not only a visible difference but a tactile difference to the magazines. I will often have both types of magazines loaded in my safe right next to each other. It keeps me from grabbing the wrong magazine for the range bag. Can you get Lancer magazines over there, Kampfhamster? That's what I prefer. The translucent smoke ones. Make sure your rifle's lower will accept the Gen3 over travel stop if you go that route. My Noveske does not, and filing the over travel stop on a $15 mag aggravates me, but not enough to ditch a $2000+ rifle that gives me MOA if I do my part. What I'm going to say is going to be confusing, but there is a point at the end. First off, congratulations on your first custom AR. 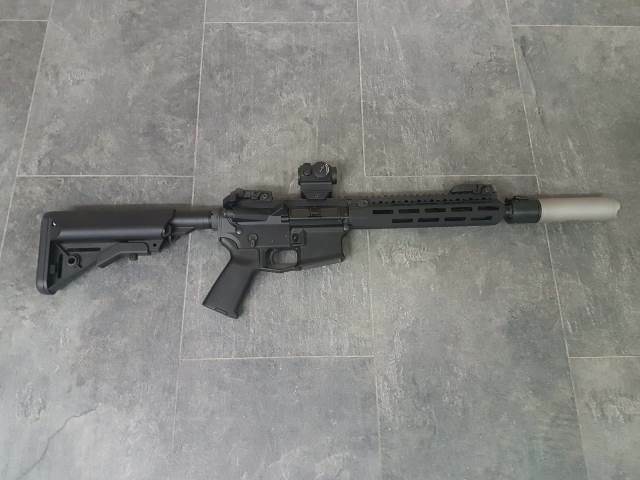 Looks like an 11.5" bbl with suppressor, BCM MCMR handguard. I'm going to assume that it's traditional direct impingement AR, and not a piston. There are three generations of Magpul PMAG AR magazines. First, there are the gen 1s that used to come in clear front with white backed bags. These are no longer made so we don't really need to discuss them here. Second, there are Gen2 PMAGs (a.k.a. "PMAG M2"). These are the most common PMAGs. Structurally, there are two variations of Gen2 PMAGs: with window and without. The windows are relatively narrow strip of clear polymer inlaid into both sides of the magazine such that the user can visually check the approximate number of rounds in the magazine. While the Gen2 PMAG is the like the most common PMAG made by Magpul, it was made with the AR platform in mind. It is not compatible with certain other 5.56 platforms like the HK416 and the FN F/FS2000. The reason for this is that the Gen2 PMAGs were built with an over-insertion skirt that projects from the sides of the magazine. This skirt is designed to prevent the end-user from smashing, and damaging the feedlips of the magazine against the bottom of the bolt carrier, or otherwise over-inserting the magazine. The problem with the placement of the overinsertion skirt on the PMAG M2 is that the skirt is too high on the magazine and will stop the magazine from seating on HK416 receivers and FS2000. I don't know if the same is true of AUGs with the NATO stock. PMAG M2s were also slightly wider in body width than USGI magazines, which caused them to not drop free in some non-AR platforms as well (like the IWI Tavor). With the Gen3 PMAGs ("PMAG M3") Magpul made a small number of changes which included narrowing the magazine body, altering the overinsertion protection into a rearward-facing tab, and adding stippling to the lower section of the magazine, and slimming the girth of the magazine baseplate. The body narrowing and overinsertion tab were concessions to non-AR platforms so that the same PMAG could be used across a wider array of 5.56 platforms. To keep overinsertion protection, the PMAG M3 had a tab at the back of the magazine that projects away from the spine of the magazine. This addressed issues with firearms that had skirts that were lower than that of a traditional AR. As far as the narrowing of the body is concerned, there were some initial concerns about the strength of the polymer. Magpul said that it altered the formula of the plastic to make it stronger, but since I can't prove that empirically and independently, I'll just relay what was told to me. I've never seen an PMAG M2 crushed by reasonably normal use. Because people were marking their magazines, usually on the side of the lower body, Magpul introduced stippling there, so it was easier for end-users to paint-marker or otherwise number/individually identify their magazines. Finally, Magpul streamlined the baseplates of the PMAG M3 so that when magazines are stacked together (as in a mag pouch), they were less likely to catch on each other (i.e. you go to pull one magazine and it catches the other mag, dumping the other one out of the pouch and onto the ground). Both M2 and M3 generations come in windowed and non-windowed versions. As to your question specifically, the magazine I would recommend would be a non-windowed M3. The reason for this is that, in your geographic location, you are likely to have to feed a non AR 5.56s and the M3 is better than the M2 at doing that. This is going to favor the PMAG M3. So M3 over M2 in your case. Second, I would recommend the non-windowed M3 because, with a suppressed traditional direct impingement AR, you are about to experience a whole 'nuther level of dirty. That dirty suppressor gas goes everywhere, including down into your magazine. Because it's going to coat the inside of your magazine, I'd avoid the windows. They aren't necessary for the functioning of the rifle, and it would take a bit of shooting to turn them completely opaque, but if you shoot quite a lot without cleaning the magazine, that window is going to be more of an indicator of how dirty your magazine is than how many rounds you shoot. So, my recommendation for your specific application is PMAG M3 non-windowed, if possible (and given only a selection between MAGPUL products). I prefer Lancer AWM magazines myself, and would recommend them over PMAGs of any generation, if you have that option. Finally, I would look up how to do an RTV seal on the charging handle (or you can email me with instructions, but I don't think I have my step-by-step photos anymore). That will prevent the squirt-eye effect where gas comes out of the charging-handle slot and up behind your shooting glasses. It doesn't happen to everyone (depends on where you put your head when you shoot), but it can be annoying. thank you for that in deep answer to my question. Whats does a Lancer magazine do that a different mag can't? As for the gas in the eye problem when shooting with a can, my gunplumber already took care of that problem. The rifle was built with that in mind. The Lancer AWMs have, IMO, a superior combination of components. The feed lips are steel so you don't have feed lip cracking or spreading issues. Wear on the feedlips is also reduced. While PMAG proponents will say their feedlips never spread or crack, it's not an issue I want to ever take a chance on. The bodies are grippy, but they don't have the over-sized floor plates that cause magazines lift each other from pouches if stacked improperly. It's not that Lancers can feed ammo and PMAGs can't. But for us, we have historically had legislation that limited us to a certain number of magazines (or as many as you could afford at a certain point, but no more after that legislation was passed, so what you bought had to last), so the longevity of a magazine mattered. So since this thread is already going, LDD, do you have any recommendations in regards to metal magazines for the AR-15 platform? I've used USGIs and HK maritime mags. By USGI, I mean actual USGI magazines like OKAY, Center, Parsons, etc. (not mags like Brownells and Stoner that look like USGIs). Outside of pre-ban/ban era USGIs that outlived their lives in some form (worn out feedlips or springs, tilting followers) my experience with metal mags has been very good. The HK mags were reliable, but, in my opinion, their weight and price were big negatives. They were no more reliable than a Lancer AWM, but weighed a ton more and cost sometimes 3x what an AWM will cost today. I bought some for $12 each, never paid the $65 that some are asking for them. They were heavy enough to qualify as weapons or boat anchors in their own right. Unfortunate, because I have "more than one." I do not have much experience with post-ban metal aftermarket mags like the ASC. If I was limited to metal magazines today, I would go with OKAY surefeed magazines. I have not played with their newest E2 textured bodied magazines. I suspect Brownells mags are actually just re-branded OKAY mags, but I'd need to check the spot weld pattern to say more. Quick Reply to: what magpul magazines to get?